Three types of administrative bodies functioned at the village level in the ancient Tamilnadu. The brahmin villages popularly know as mangalam or chaturvedimangalam had sabha as the administrative unit. Villages dominated by vellalas and commonly mentioned as ur are the ancient settlements that were administered by land holding cultivators of that village collectively known as urar (those of the ur). Settlements of trade groups named as nagaram were administered by nagarattar, probably members of mercantile communities who had land holding in that particular settlement. It is the second group which was though numerically more was not taken up for a profound study by many as in the case of sabha.1 To compensate this, a humble study of this corporate body, the urar was made with the help of Chola inscriptions engraved in the temples of Thiruchirappalli district. Ur also known as vellan vagai village generally included habitation quarters, cremation area, drinking water ponds or lakes, irrigation channels, cultivable lands and the pastures with or without forest cover. A few inscriptions mention about common land of the urar (urar nilam) as in the case of sabhas. The habitation quarters also known as nattam had four types of settlements. Urirukkai formed the quarters for land holders and cultivators. Artisans such as black-smiths, gold-smiths, carpenters, weavers, pot-makers etc. occupied the kammala cheri. The other two settlements parai cheri and ilach cheri had the agricultural labourers and the coconut tenders. In a few inscriptions a certain pulai cheri nattam is also mentioned. It is strange to note in a few records that some of the villages were surrounded by a compound wall and at some villages even the residential quarters of the mercantile and artisan communities were also encompassed by such compound walls. Urar, a collective communal term indicates the land holding cultivators of a particular village who functioned as an administrative unit. In the early inscriptions of Thiruchirappalli district urar appear as a body and no individual names are mentioned, though exemptions are met with in one or two records (‘Thiraiyan Panaiyan ullitta urom’). On the contrary in later records names emerge with titles of possession such as kilan and udaiyan. These individuals though not the sons of the soil, as possessors of land units in the village became leading people part taking in the assembly of urar and signed documents in individual capacity. Two early records attest the communal nature of Urar as ‘ur eva elutinen’, ‘ikkurrattu uray isainta kodiyalattu urom’. 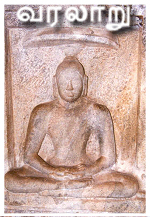 A later Chola record from Uyyakkondan Thirumalai stands as an explicit evidence for the individual capacity of urar in signing the documents where in more than fifteen signatories appear, ten of them being land holders and the rest attached to the temple. Urar engaged in activities related to land such as sale, gift, exemption of taxes etc. Sales of joint nature with other administrative bodies such as sabha and nattar are also noted. They also accepted endowments from various agencies and individuals agreeing to carry out the required service from the interest accrued from the capital entrusted with them. At times depending upon the needs of the temple or the village, orders were issued after deliberations that such needs may be taken care of through collections made among themselves in terms of either paddy or cash. Urar were responsible for the collection and payment of taxes. In some cases urar undertook the responsibility of appointing necessary staff among themselves for the temple and making payment to them in terms of land as jivitam after accepting a whole sum amount from the donors. Revenue received from these villages is mentioned as ‘vellan vagai mutal’ in some inscriptions. An accountant by name ur kanakku probably maintained account registers apart from writing documents in each village. They were provided with a piece of land in the village mentioned in the inscriptions as ‘ur kanakkan jivitam’. As in the case of sabhas madhyastas were also functioning at some of these vellan vagai villages as revealed by some inscriptions. Rarely these accountants of ur are also mentioned as karanattan.16 As kanakku and madhyastan, this nomenclature is also applied commonly for all the local assemblies (Malanattu karanattan, sabhai karanattan). In a few records that mention about the payment of tax, it is stated that the purchaser may arrange to pay the same amount of taxes that are in lieu in the village using the phrase, ‘urodu otta irai iruttuk kolla’. The same message is conveyed in another inscription by the phrase, ‘ivur iruttu varum mariyatippadi’. As in the case of sabha urar also received royal letters with specific orders concerned about their village lands or the local temples. Most of these orders dealt with remission of taxes or gift of lands. A record of Rajakesarivarman from Thirunedungalam registers a sale of land made jointly by sabha, urar and devakanmis of the temple at Thirunedungalam to a certain Araiyan Chadura Vidankan of Puttamur. The irrigation of the said land is also decided mentioning the frequency and the channel through which the water flows to the land. A record of Rajaraja III from the temple of Thiruvalisvaram at Turaiyur239 states that the urar of Turiayur in Pachchil kurram in Rajaraja valanadu consecrated an image of the goddess of the Thirukkama kottam named Nallanayaki and an image of Subramaniya Pillaiyar in the temple and made a gift of land in favour of these images towards offerings and worship, undertaking the responsibility of paying the taxes due on the land. As a later inscription it provides the names of number of individuals who represented the urar as signatories. The document writer Kariyamani Devan is mentioned as the ur madhyastan. An inscription of Rajendra III from Somasundaresvarar temple at Ariyur records an agreement made among the residents of that village to collect paddy as sannidhi vari at the rate of one padakku per head per crop and one padakku per plough for offerings, services and repairs to the temple. The agreement was written by the accountant of the village mentioned as ur kanakku. It is considered as an order and is mentioned as ‘niyogam’ in the inscriptions. The same term is used to denote an order issued by the authorities of the sabha of Madurantaka chaturvedimangalam at Nattamankudi. Urar of Andanallur received 30 kalanju of gold from the temple authorities of Thiruvalandurai Paramesvara and agreed to light a perpetual lamp at the temple out of the interest accrued upon it. An inscription of a certain Parakesarivarman reveals that Singan Nimmadikal queen of Chembiyan Irukku Velar entrusted 30 kalanju of gold with the urar of Mullikkurumbil to light a perpetual lamp at the temple of Andanallur. The urar assured the donee to carry out the required service with the interest accrued upon the capital. Records referring to royal letters sent to the ur assemblies are available in the study area. Fourth regnal year inscription of a certain Parakesarivarman throws light on a royal letter sent by Virachola Ilangovel alias Orri Madurantakan to the urar of Allur, instructing them to enter one veli of land as kudinikkiya devadanam in their records and allocate half veli towards maintenance of temple offerings and the other half is to be given for three persons who were reciting tiruppadigam at the temple. When the royal letter arrived urar received it with due respects by worshipping it and keeping it over their head. It was then read out and obliged. The document so written under the order is mentioned as ‘araiyolai’ in the inscriptions as it is made known to the entire village. It is interesting to note that none of the records that deal with Ur assemblies of Thiruchirappalli district mention the existence of any electoral system or the formation of committees as in the case of sabhas. Similarly the mention of the place of meet, the procedural formalities maintained for the gathering of the administrative body and the functioning of the meeting held which are met with in the records of the sabhas are not traceable in any of the inscriptions that deal with the vellan vagai village in this district. It must also be said that against the view of the scholars the residents of the non-brahmin villages say the urar were also literates as their counterparts at sabhas. 1. For further Study: Kesavan Veluthat, The Political Structure of early Medieval South India, Orient Logmen, 1993; Noboru Karashima, Varalarruppokkil Thennakach chamugam, 1-Cholar Kalam, Tamilaga Tholliyal Kalagam, Thanjavur, 1995; Y. Subbarayalu, South India under the Cholas, Oxford University Press, New Delhi, 2012. 3. SII 19: 395; SII 26:752; SII 8: 192. 4. ARE 1929-30: 251; ARE 1936: 138. 9. SII 8: 695; SII 8: 587. 12.P. Shanmugam, The Revenue System of the Cholas, 850-1279, New Era Publications, Madras, 1987, p.118. 13.ARE 1928-29:130; ARE 1914: 137; ARE 1938-39:165. 14.Varalaru 2 p. SII19; 4: 396. 15.SII 8: 698, SII 26:752. 16.Varalaru 2: p. 3; SII 13: 26. 17.SII 13: 26; SII 24: 1 & 6.